sensenet provides a way to access your content via WebDAV, allowing Microsoft Office, Windows Explorer, Total Commander, Visual Studio, etc to open and edit content residing in a sensenet Content Repository. 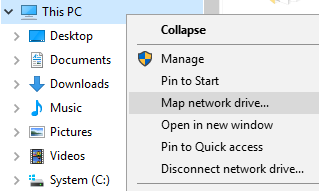 The Content Repository can be even mapped as a drive. 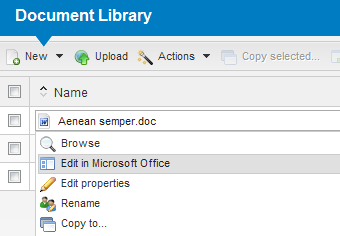 Office documents can be opened directly from the portal surface with WebDAV. When a document opened via WebDAV is saved, it is automatically versioned, permissions are automatically checked, etc. Drag and drop move and copy also works. WebDAV automatically works in sensenet, but there are a few things you may have to configure before you can access your Content Repository as a file system. Windows authentication Set up both your sensenet site content to use Windows authentication, and your IIS web site to allow Windows authentication. Make sure your AD user is present in the Content Repository under the appropriate domain. You will be able to access your fodlers and files in the Content Repository using your AD user and password. Basic authentication Set up your sensenet Site to use Forms authentication, and your IIS web site to allow Anonymous authentication only (do not allow Windows in IIS and allowing Basic is not necessary). You will be able to access the Content Repository using your portal user and password. Please note that operations that use Basic authentication over a non-SSL HTTP connection are disabled by default by your operating system. To enable WebDAV for non-SSL sites with Basic authentication refer to the following article: http://support.microsoft.com/kb/2123563. Please note that support for Basic authentication has been introduced in sensenet 6.1. Earlier versions must use Windows authentication for using WebDAV. Make sure you don’t have WebDAV publishing installed, as it may interfere with sensenet WebDAV features. The UI above is available only if you installed the WebPages component. If you do not have that, you can still put an action link onto your custom UI that lets your users open Office documents - please check the details on the link below. From here onwards you can use this drive to manage your Content Repository: uploading, editing, deleting, renaming content can be done just like using a normal file system. You’ll find the settings above in the /Root/System/Settings/Portal.settings content. For example when dropping a file with .png extension the content created in the sensenet Content Repository will be of the Image type. The configuration for WebDAV can be found in the web.config under the webdav section. MockExistingFiles: some versions of WebDAV clients shipped with Windows will automatically probe on certain files and will fail to continue if those files are not present. Since these files are never present in a sensenet Content Repository, the WebDAV handler mocks these files as if they existed there to ensure flawless operation. 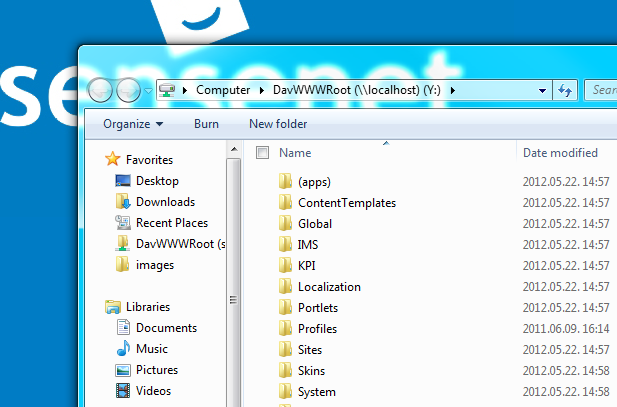 These files may vary from system-to-system, so if you experience any problems with opening sensenet folders via WebDAV it is possible that your WebDAV client is looking for files not present in the Content Repository. Use fiddler or a debug version of sensenet with dbgview to detect this situation and extend this list with the file names to be mocked as existing. AutoCheckoutFiles: if set to true, files opened in Office will be automatically checked out (locked) to the user. Default is false. WebdavEditExtensions: a comma separated list of file extensions (if not set, the usual Office types are listed by default). When a file is downloaded from the portal with the ‘download’ url parameter, only the files with these extensions will get the correct filename value in the Content-Disposion response header that browsers use to save the file (currently this feature has nothing to do with the WebDAV functionality). It is possible to customize the behavior of the WebDAV feature by developing a custom provider. Developers can restrict what users see in Windows Explorer and what they can do with files and folders.